There is a persistent claim that new migrants to Europe, and specifically migrants from the Middle East and North Africa (MENA migrants), carry antisemitism with them. This assertion is made to different degrees in different countries and can take different forms. Nevertheless, in Europe, the association of rising antisemitism with migrants from the Middle East and North Africa is widespread and needs to be evaluated. MENA migrants have been symbolically central to the migration debate since 2011. These years have been framed by the Arab spring and its aftermath and by Europe’s crisis of refugee protection. This research project has focused specifically on MENA migrants, in response to the intensity of this debate, and in accordance with the brief from Foundation EVZ. The central concern of the research project has been to investigate whether the arrival of MENA migrants since 2011 has had an impact on antisemitic attitudes and behaviour in Western Europe. This report deals with the case of the United Kingdom. The report also considers whether government and civil society agencies have identified a problem of antisemitism among MENA migrants. The findings are based on an extensive survey of existing quantitative and qualitative evidence. Additionally, new qualitative research has been undertaken to investigate the experiences and opinions of a range of actors. This national report contributes to a larger research project conducted in 2016/2017 across five European countries – Belgium, France, Germany, the Netherlands and the United Kingdom. 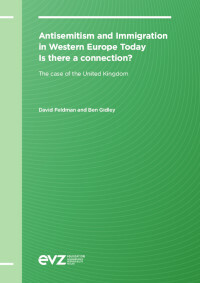 A final report, Antisemitism and Immigration in Western Europe Today: is there a connection? Findings and recommendations from a five-nation study, draws out common trends, makes comparisons and provides recommendations for civil society organizations and for governments. policy purposes as long as the authors are fully credited.